Scientist,pillar of the British Enlightenment Priestly found his spiritual home in the US- though he never took American citizenship, and exerted much influence on the new nation. As for his writings in the late 1760 and 70s he foreshadowed the language the founding fathers were to use in the 1776(Stuart Andrews). His essay on the First Principles of Government(1768)asserted the fundamental axiom of the Enlightenment that knowledge is the key to progress. the son of a cloth-dresser from Leeds, was born in 1733. After the death of his mother in 1740, Joseph lived with his aunt from whom he drew his religious views that were to pose great threat to him. His strong nonconformist religious views would cause him to flee England albeit his great contribuion to the world of Chemistry. Though sickly as a child he entered the new nonconformist Daventry Academy in Northamptonshire, where he studied history, science and philosophy. At Daventry he read David Hartley’s Observations of Man (1749) which grounded his direction in life. Priestley was deeply influenced by Hartley’s views on free will and the notion of human perfectibility through good education. In 1755 Joseph Priestley became a minister at the Presbyterian church at Needham Market. He became interested in exploring how science could improve the quality of human life. In 1761 Priestley was appointed as tutor at the dissenting Warrington Academy in Lancashire. These three books brought Priestley to the attention of Richard Price and Benjamin Franklin. Both men became friendly with Priestley and encouraged his work in science and politics. 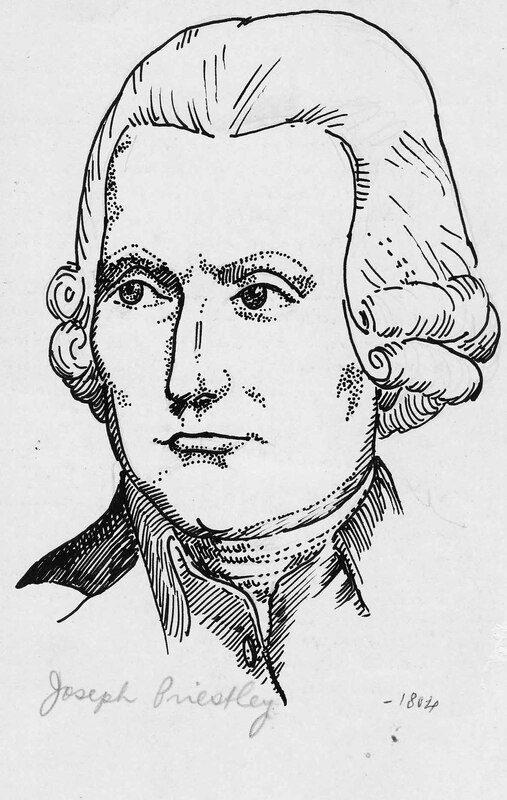 After long discussions with the two men, Priestley wrote The State of Public Liberty in General and of American Affairs in Particular (1774). The pamphlet attacked the British government for depriving the colonists their rights and liberties. Priestley’s political beliefs made him unpopular with the British government. Church leaders were also concerned with the religious views expressed by Priestley in books such as The History of the Corruptions of Christianity (1782) and History of Early Opinions Concerning Jesus Christ (1786). The books developed Priestley’s ideas on Unitarianism. They also included attacks on such doctrines as the virgin birth and the Holy Trinity. Many people, including King George III, became convinced that Priestley was now an atheist. Priestley moved to Birmingham where he became friends with businessmen and scientists such as John Wilkinson, Josiah Wedgwood, Matthew Boulton and James Watt. Whereas Priestley’s scientific work, for example, his discovery of oxygen, was welcomed, his religious and political views were constantly getting him into trouble. Priestley and his friend Richard Price became leaders of a group of men that became known as the Rational Dissenters. To the government, these were dangerous men. Hostility towards Joseph Priestley increased in 1791 when he wrote a pamphlet defending the French Revolution. Priestley argued that he believed the events in France increased the chance of “universal peace and goodwill among all nations” as it made possible an “empire of reason”. His views on the role of the monarchy upset King George III. The king and his supporters particularly disliked Priestley’s view that in future monarchs will be the “first servants of the people and accountable to them”. Priestley now obtained the nickname ‘Gunpowder.’ In 1791 Priestley published A Political Dialogue on the General Principles of Government. In the book Priestley expressed similar political ideas to those expressed by Tom Paine in the Rights of Man. Later that year Priestley took part in forming a Constitutional Society in Birmingham. Tories in the city made inflammatory speeches attacking Priestley’s political ideas and this resulted in a mob breaking into his house and destroying most of his papers, books and scientific equipment. After the Birmingham riots in 1774 he decided to emigrate to America. He settled in Pennsylvania and over the next few years he wrote several books on Unitarianism. Priestley also established the first Unitarian Church in America.